The posters in this gallery depict the small animals and plants of the underwater environment in New Zealand. f003900: A female seahorse attached to a brown seaweed in her natural habitat, the estuary, near Leigh, New Zealand. 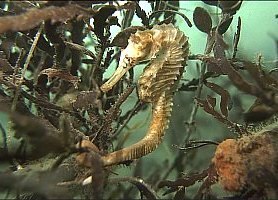 Because of its body shape, colouring and secretive habits, the NZ seahorse (Hippocampus abdominalis) is often hard to find, but it is also threatened by pollution and exploitation for the medicinal trade. f021623: In the entanglement of lost fishing lines underneath wharves, seahorses find both protection and a good grip for their tails. 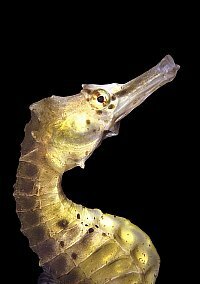 Under a wharf in New Zealand, this colourful male seahorse (Hippocampus abdominalis) spends most of its time resting but when the currents go slack, it comes out to forage for small crustaceans. f019415: By living high up in the wave-washed zone, this hydroid fan has survived to live to an old age in New Zealand. 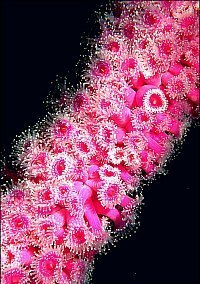 This Solanderia hydroid fan consists of thousands of little polyps that cannot withdraw like true coral. 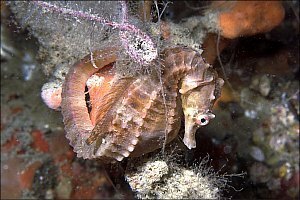 f015700: Closeup of a female seahorse. 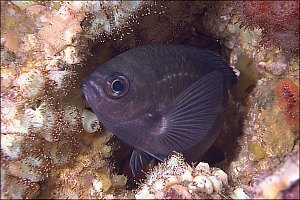 Females lay their eggs in the male's brood pouch and leave it to him to rear the young. f019316: A male demoiselle is sleeping in its little cave among jewel anemones at the Poor Knights Is, New Zealand. These little demoiselles (Chromis dispilus) are the darlings of divers because they are so beautiful, friendly and interesting. f012313: New Zealand's smallest octopus, no larger than a coin, yet mature, hides inside a smooth tiger shell. These rather small octopus (Robsonella sp.) 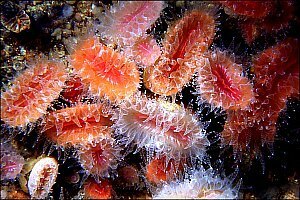 live on the sea bed, preferably near scallop shells, which they eat. 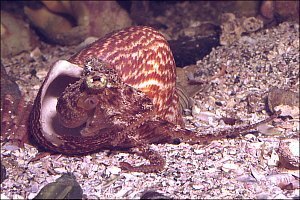 They are usually found inside the shell they have just eaten. f003718: A large purple sand dahlia anemone stands tall above the sand, 3m deep near Leigh, New Zealand. 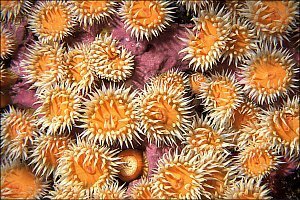 This large sand dahlia anemone (Isocradactis magna), lives on wave-washed sandy rocks where it protects itself from being sand-blasted to death. It collects and holds shell fragments with its tiny white suckers, all over the outside of its body. f019107: The common variable anemone lives in turbulent and clear waters in New Zealand. Like others, this variable anemone (Actinothoe albocincta) can reproduce by splitting parts of its foot as it walks about, causing dense and regular patches like this. 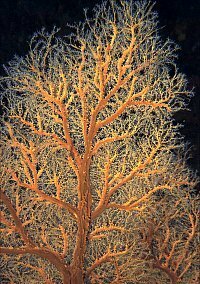 f019300: Cup corals grow in dark places, where they may cluster closely together. 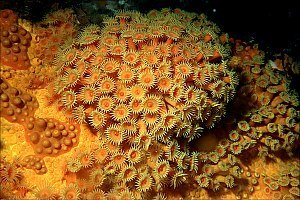 This cup coral (Flabellum rubrum) makes a hard limestone cup to protect its soft body. 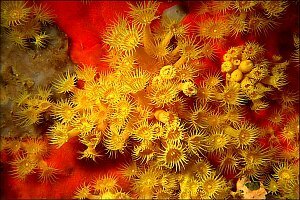 f019624: A posy of pretty yellow flowers is all that can be seen of the struggle for dominance between the yellow zoanthid anemones and the red encrusting sponge behind. 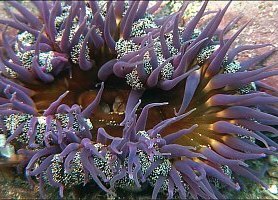 Zoanthid anemones reproduce copies of themselves as they wander around, conquering space rapidly, while menacing slower growing species. f021312: Closeup of common variable anemones growing on the railing of the Rainbow Warrior wreck, New Zealand. The common variable sea anemone (Actinothoe albocincta) catches zoo plankton with its tentacles. It can inflict serious stings by shooting sticky threads loaded with stinging cells, from the side of its body. f023817: A bouquet of zoanthid anemones on a cliff wall inside Middle Arch, Poor Knights Is, new Zealand. 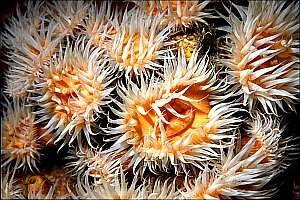 Similar in colour to the boring sponge underneath, zoanthid anemones conquer precious space by growing over other organisms and suffocating them. f021315: Shrinking to insignificant blobs by day, these purple jewel anemones perform fireworks by night on the wreck of the Rainbow Warrior, New Zealand. This particular variety of jewel anemone (Corynactis haddoni), grows over deceased black coral trees and in this case, even a wreck's railings. Purple jewel anemones decorate a railing of the Rainbow Warrior wreck, Cavalli Is, New Zealand. 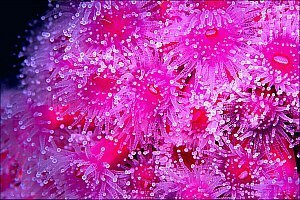 Jewel anemones (Corynactis haddoni) have spectacular colours, many fluorescing by day.